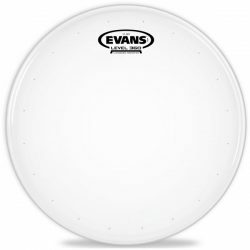 The Coated Evans EC Reverse Dot is a very durable 2-ply snare drum head. This head removes ringing overtones and gives a big, warm attack. The Evans EC Reverse Dot Coated is a thick 2-ply coated snare drum head, made with a top ply of 7mil and a bottom ply of 10mil. 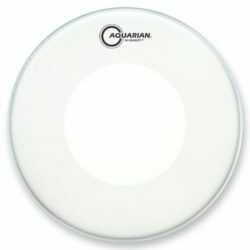 This drumhead features a center control dot and control rings, both of which help to really focus the sound. The top coating adds a warmer tone, and gives a responsive surface for playing with brushes. 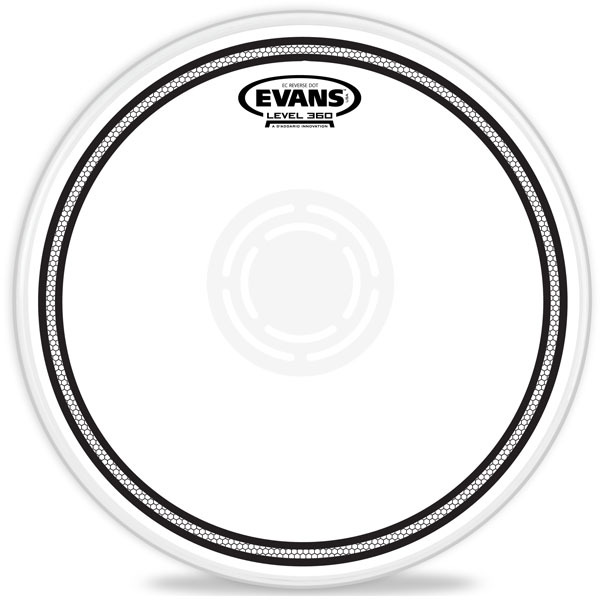 The Evans EC Reverse Dot is a very controlled drumhead that can take a beating. 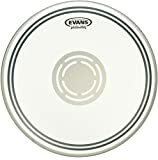 At 17mil total thickness, the Evans EC Reverse Dot is thicker than standard 2-ply drumheads, giving this head a warmer and more controlled sound. The EC Reverse Dot is very focused, thanks to the combination of the center dot and control rings. Ringing overtones are almost entirely removed, and the sound is very focused on the fundamental note. There is a short sustain, with a warm and deep tone. 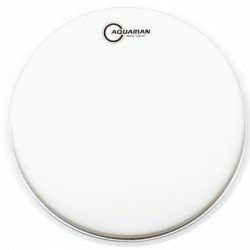 If you’re looking for a drumhead that won’t ring out, the EC Reverse Dot is for you. Tuned low, the sound is short, punchy, and fat. There is a lot of life in the sound when tuned higher, especially when hit harder. Across the entire tuning range, no dampening is required with the EC Reverse Dot, due to the control dot, control rings, and thick build. 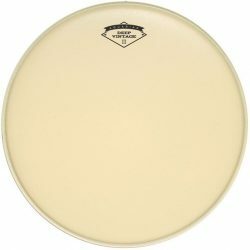 The design of this drumhead means it can be hit hard to produce a big sound. 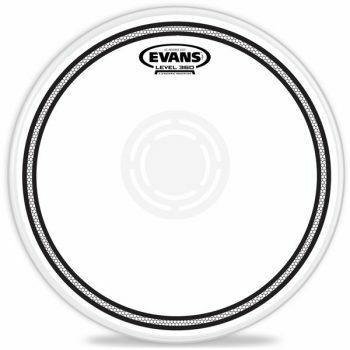 The Evans EC Reverse Dot is extremely durable, thanks to the thick 2-ply construction and the added center dot. When hit hard, this head gives a big attack and very good projection. 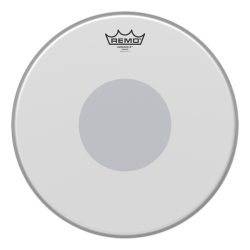 The EC Reverse Dot is an excellent choice for heavy hitting drummers who play loud styles of music… This drumhead can handle long-term abuse. 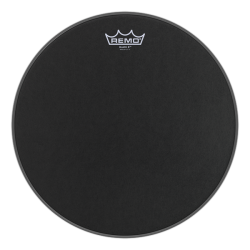 Note that at very quiet volumes, the thick design means this drumhead is not very sensitive. If you play a lot of ghost notes and small accents, you may not get the responsiveness you need (especially at low or medium tensions). The Evans EC Reverse Dot is built to for medium and high volume drumming, and you can lay into this head without worrying about damage. 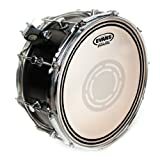 Overall this is a very controlled and warm sounding snare drum head. The Coated Evans EC Reverse Dot is a great choice if you need a long-lasting head for loud drumming, with no ringing overtones. Importantly, the control dot is on the underside of this drumhead. This means that it won’t get in the way of brushes, and it won’t affect responsiveness too much when used with sticks. 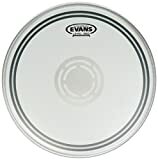 The Evans EC Reverse Dot is designed for snare drums, and is available in 10″, 12″, 13″, and 14″ sizes. These sizes can also be used on toms, for a very short and focused tom sound.